One of the financial statements that has long been available in the Advanced Accounting series including its predecessor versions is "Changes in Financial Position (Cash Flow)" sometimes referred to as "Sources and Uses of Cash" (or sometimes the word "Funds" instead of "Cash"), or simply as a Cash Flow Statement. Settings for the cash flow statement have typically followed the same approach as for the other two financial statements (balance sheet and income statement) but with with inclusion of an income/expense and non-cash expense range along with asset and liability sections. 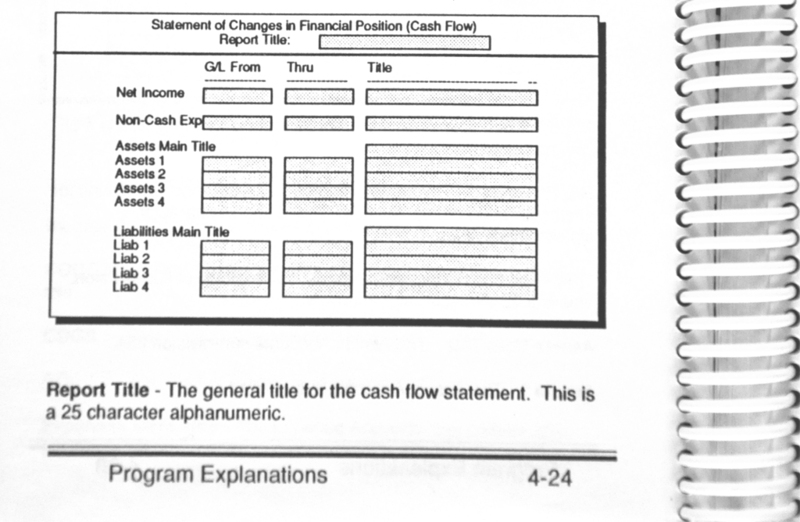 When setting up a GL chart of account, the program has always had a "Non-Cash" flag, the sole use of which is in connection with the cash flow statement. And this continues to be the case in all versions. Books 2.0 and Advanced Accounting 3.0 looked and worked substantially the same as in TAS-Books* version, continuing with Advanced 4.0, 5.0 and 5.1. 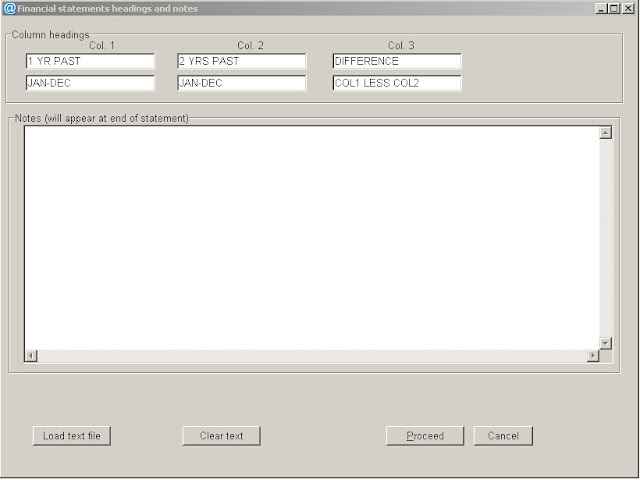 Graphical printing was added in version 6.0. 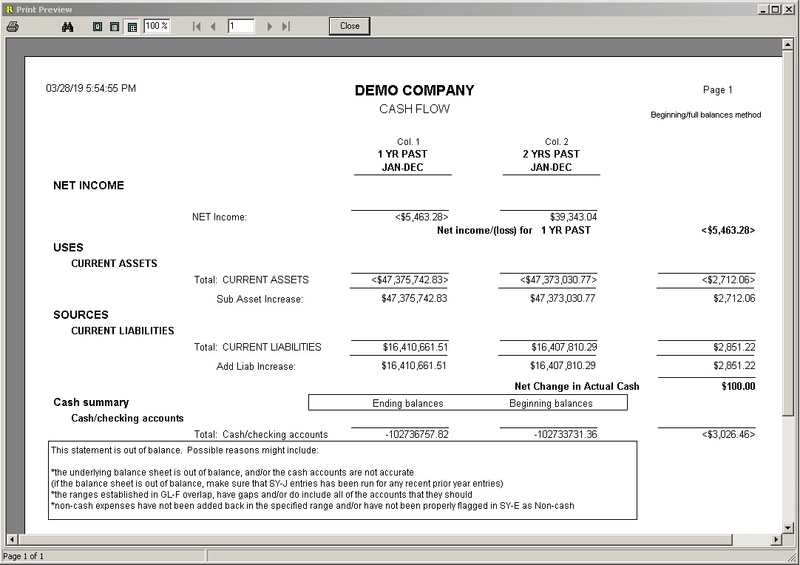 In 2010 in the 7i version, the suite of financial statements were "re-made" into a fuller graphical version with some additional new features. 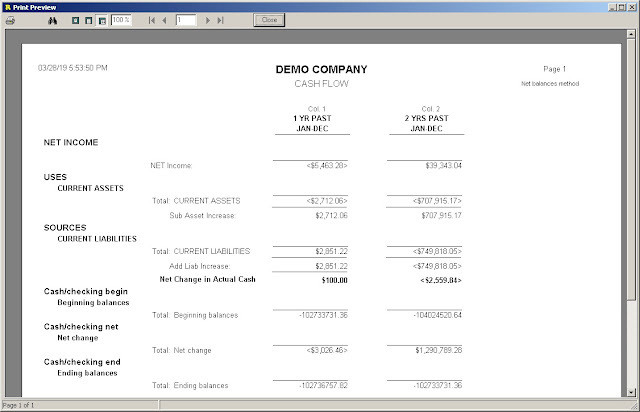 The cash flow statement logic however remained basically the same through version 7i. Starting with Adv 8 (2019 release) however it has been significantly changed. While the Advanced Accounting cash flow statement option historically could be used to help predict cash flows and if run correctly could produce an accurate net cash change, it fell somewhat sort of performing as a true cash flow statement. Using the so-called indirect method of preparing a cash flow statement is really sort of an upside down balance sheet with a twist: it involves comparing a set of financial account values to some prior period (usually the immediately prior year, quarter, or month). This was accomplished in past versions by a from to through month approach, and comparing the difference in the net balances in established ranges from the balances at the end of the from month to the end of the through month provided that the user did not "include beginning balances" but with no "proofing" of the change value computed to the actual increase/decrease in cash. 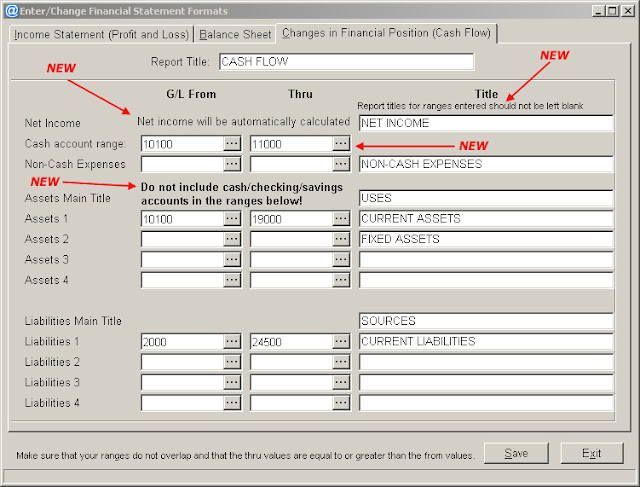 The idea of a cash flow statement is simply to show the increase or decrease of "cash" accounts (checking accounts, actual cash in a cash drawer or petty cash fund, money market accounts, merchant accounts, deposits in transit not yet delivered to the bank, certificates of deposit, savings accounts and the like) from one period to the next. 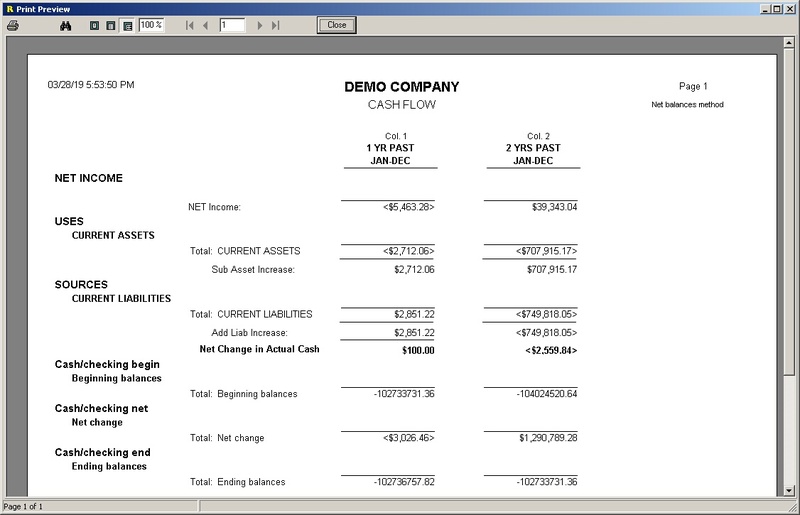 The standard cash flow statement using the indirect method can also be thought of as a sort of a crude accrual to cash conversion starting with net income for a selected prior of time, making adjustments based on the differences in usually a prior balance sheet period, leading ultimately to a computed increase or decrease in cash relating to operating activities. Cash flows from investing and financing activities are also normally identified in a cash flow statement. This has not been the case with the Advanced Accounting software cash flow statement option, and we have elected to continue to combine those activities into the operating section for now since these are not normally materially significant activities for most of our users. Since cash flow statements can be somewhat unintuitive to setup properly and confusing at times to read, we have taken steps to try to simplify the setup and to also make our own changes to the format which we think helps to better focus on understanding the increase/decrease in cash from one period to the next. 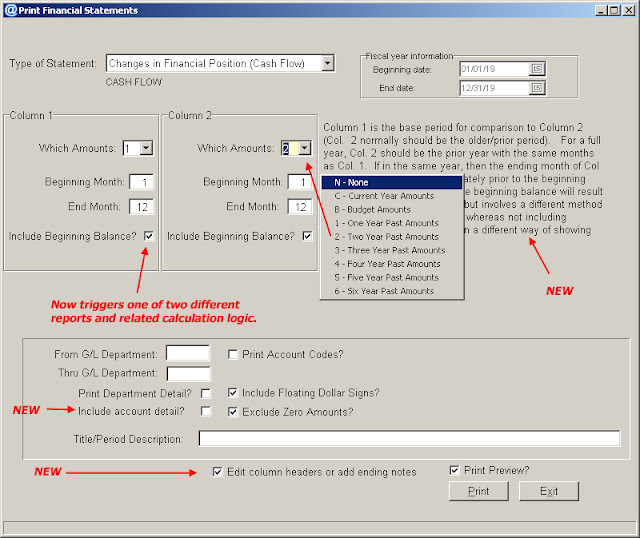 Further, now, the user cannot cause erroneous values to be computed if they choose "include beginning balances." 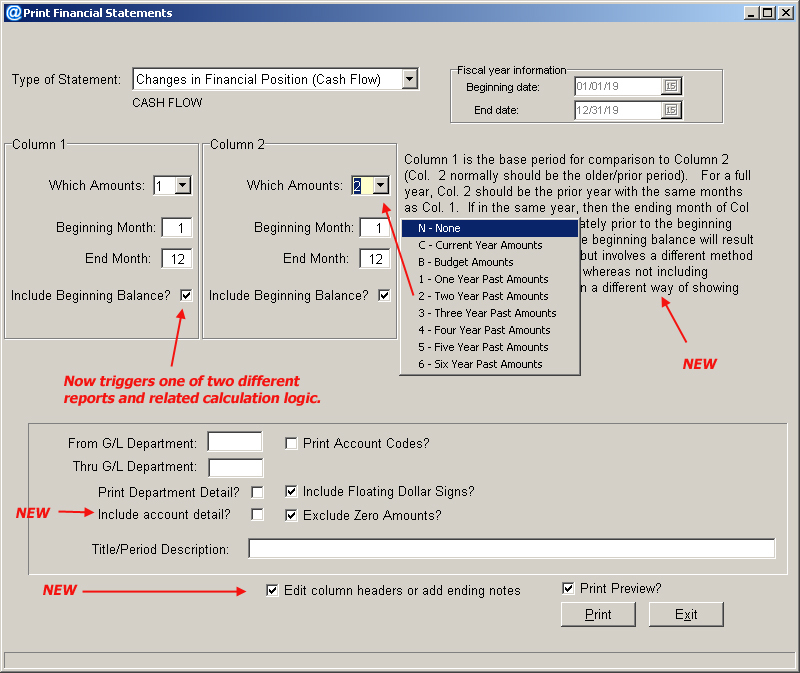 Instead, depending on that selection, the Adv 8 version produces either a "net balance" cash flow analysis as it has in the past (but with a new cash summary at the end with actual beginning and ending balances) or a "full balances" method that compares the difference in balances between two different time periods (the only complication with this approach is that an adjustment for the change in retained/current earnings between the two periods has to be made in order to accurately compute the cash change). Most users in fact would do well to simply always include in their balance sheet and income statements a "one year past" or similar comparison column with a third column that shows the dollar (and optionally percentage) differences. 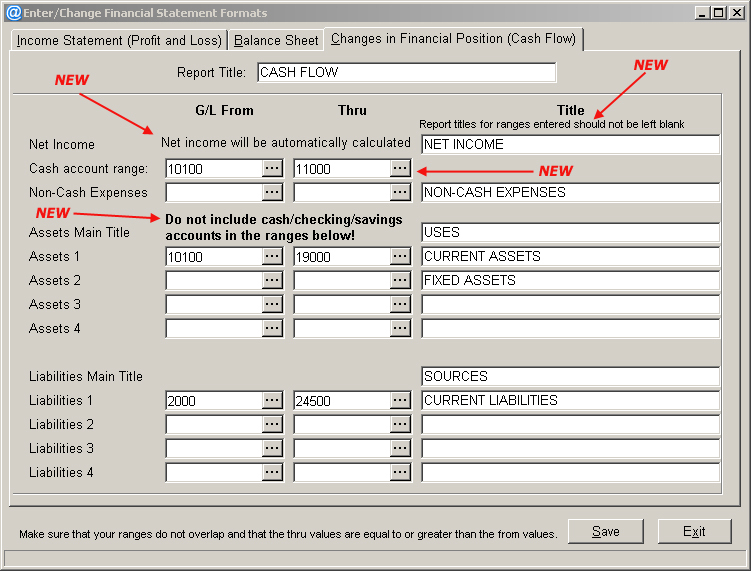 Appropriately formatted side-by-side balance/income statements with a third "difference" column that Advanced Accounting has always provided are not only easy to read but include all of the information normally that a financial statement reader might require and if correctly formatted, clearly shows the increase or decrease in cash flows. To some extent the cash flow statement then becomes largely redundant. A new option allows the user to include detail or not. Normally a cash flow statement is summarized and doesn't include the detail, so by default, "include account detail" is not checked but can be chosen for a higher level of analysis. This is different than how the income/balance sheet options normally work (they always provide the detail). Beginning and ending cash and other balances are provided in one of two different formats depending on whether the user is included balance forwards or not. One of these is in a column presentation similar to how they would be viewed in a side-by-side balance sheet comparison which we believe makes them easier to understand. The other includes not just beginning and ending balances but also the actual change in each account which can be displayed on a detail basis. We have intentionally, for now, limited the cash flow report to two years' worth of columns (plus a third different column if "Include Beginning Balance" is checked that is automatically generated without user interaction). Income statements/balance sheets continue to be able to have any desired combinations of current to six year past amounts in up to four columns and the ability to specify a difference column. In a future release we may provide an option for a 12 month column view/analysis for each of the three available financial statements. Cash flows and payments can of course be analyzed in other ways. 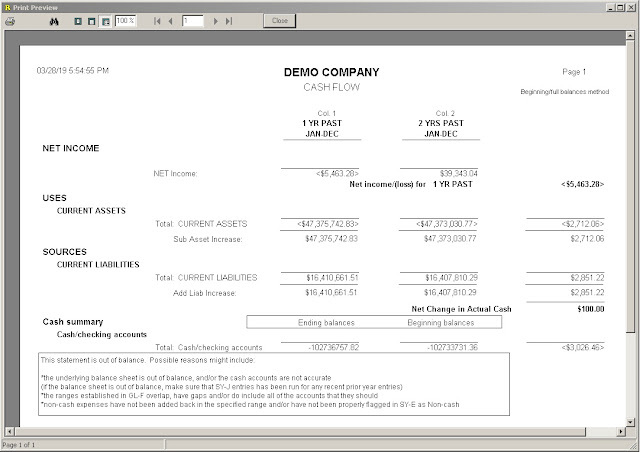 Besides the obvious options in the general ledger detail for cash receipt and cash disbursement types by posting date or general account, customer payments can be analyzed both in the credit analysis report option as well as in the accounts receivable aging "as of date balance/transaction type history" where the output can be limited to payments (and in the latest version, pay types can be further limited to one of six different types including checks, credit cards, cash, e-transfers, other and refunds). Point-of-sale (POS) users of course have the additional POS report options that includes on specifically for payments and that can be narrowed down to not just date but also time and payment type. On the vendor side, in addition to the accounts payable payment history option (which can include, exclude or only include electronic payments), the AP aging "as of date" option can be used to show only type "P" payments to determine the actual amounts paid to all or a given vendor for a desired date range. *TAS-Books originated in the United States. It was co-opted for use overseas and evolved into a completely separate product that was never officially licensed by the original publisher (Business Tools, Inc.). 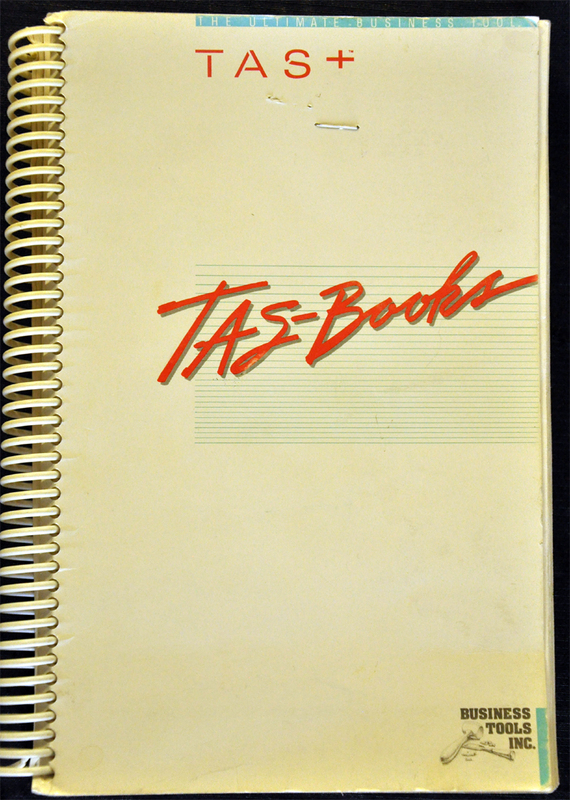 TAS-Books was developed using the TAS-Plus (TAS+ 2.0) programming language also developed and published by Business Tools, Inc. Later versions based on the TAS Professional 3.0 language were called Books and Advanced Accounting (which first included multi-location inventory tracking, among other things). Since version 4.0, the accounting software has been referred to solely under the Advanced Accounting name/trademark but long-time users still sometimes refer to it as "Books." 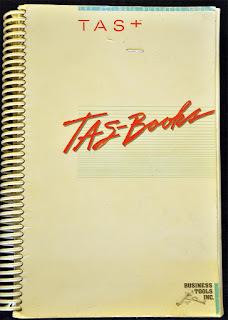 The data files and program names going back to the TAS-Books version were consistently named starting with the letters "BK" (for example BKSOA.RUN for the sales order runtime program, BKARINV.M for the sales order header data file, later BKARINV.B) referencing the product's early beginnings as "Books." +The data in the report samples is test data and not based on a real, balanced system, and is being shown solely to show what these reports look like with summarized data. If the detail option was selected, then the individual account detail within each section would be displayed.